Having no idea what this “Pinterest” was, I went home and Googled it. I followed the prompts until all of a sudden I realized I had my own account. I had no idea what it meant but was too tired to figure it out. I went to bed. The next morning, however, I got a Facebook message, “Alert alert beware. You have just joined Pinterest?? Your life is about to change. Between crafting, gardening and recipes, your family may never see you again. Good luck :)”. Good grief! What had I gotten myself into? Now that I have spent a few of hours figuring it out, I know exactly what I have gotten myself into. I have joined a community that creates and shares collections of images. Unlike other social networks, this one is built around pictures instead of words. It is alive with photographs of ideas, accomplishments and inspiration. I have seen a photo of a seven-layered rainbow cake, pillows that looked like scrabble tiles and a photograph of a gorgeous ocean wave backlit by the summer sun. Part of what I am enjoying about Pinterest (and presumably what others enjoy, too) is simply looking at pretty pictures. More than that, however, I love that it is encouraging me to slow down and dream a little. I have been poking around blogs and websites, admiring photos from botanical gardens and backyards all over the world. I have sighed over incredible beauty and stopped to appreciate how someone has created unique combinations of flowers. 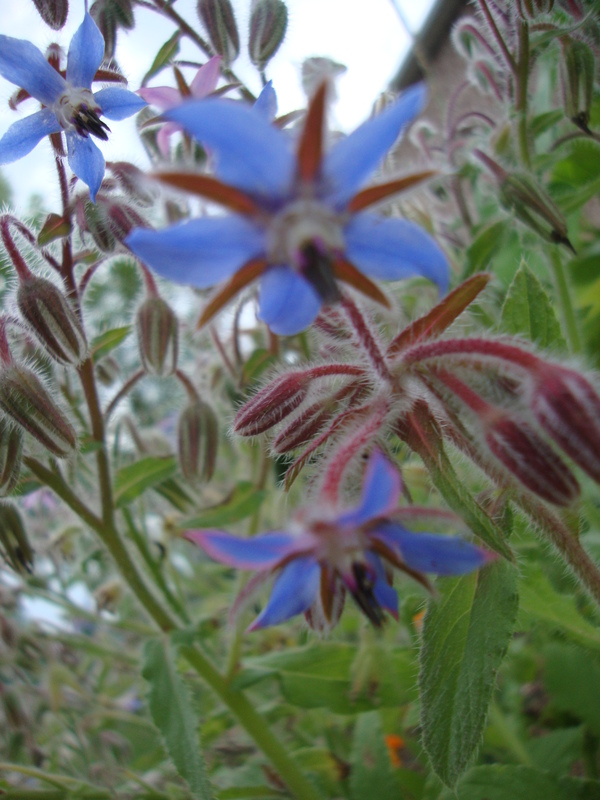 I have reminisced a little, too, when finding pictures of pretty blue borage…ah, Pimms…. My humble “Garden Dreams” board gives me a place to focus my imagination. It may not be practical to build a replica of the fountain I love at the New York Botanical Gardens, but maybe that photo will inspire me to create my own unique water feature. And in a busy life full of so many plain and practical details, I need something to lift my nose (and my eyes) from the grindstone. I need help remembering that there is more to life than budgets, bicycle tires and bathrooms that need cleaning. In this world of ours there is also beauty and tranquility and creativity. Despite the dire warning, my family still knows what I look like. And a little bit of dreaming now and again hasn’t seemed to hurt me at all. This entry was posted in Uncategorized and tagged backyard, garden, inspiration, rest. Bookmark the permalink. 2 Responses to Alert alert beware. You have just joined Pinterest? ?